The vanities are small kind of dressing tables with a few rows of drawers. There are various traditional bedroom vanities made by using different materials. 9. Vanity Set with Mirror by Monarch Specialties Inc.
Give a stylish flare to your bedroom décor with this lovely GoodHope Vanity Set with Mirror. MDF, rubberwood and birch veneer construction renders strength and durability to the vanity set. The GoodHope Vanity Set features five drawers, a tri-fold standing mirror and bench. Five drawers and spacious table top can accommodate all your vanity essentials. Beautifully designed legs and bronze finish knobs on drawer fronts accentuate the overall look. The matching stool is upholstered and cushioned for maximum comfort. GoodHope Vanity Set is available in multiple finishes so that you can select the one that blends best with your room exterior. Manufactured from MDF, rubber wood, and birch veneers. Also available in Black and Cherry finish. Includes vanity table, mirror and matching stool. Mirror is adjustable and removable. Five drawers for keeping your jewelry and make up items. Design of the handle: Ring pulls in bronze finish. Seat of the bench is upholstered in lavish plush fabric. Required tool for assembly: Screwdriver. Maximum weight capacity for the bench: 200 lbs. Poundex provides warranty for 6 months. Classic and timeless Linon Angela Vanity Set with Mirror provides you with ample storage and grooming space. You can place this elegant vanity table set in your bedroom, dressing area or large bathroom. The Angela Vanity table features a flip top with an open storage area and a hidden mirror. The spacious top and two storage drawers allow you to keep your vanity essentials organized. Square pulls on drawer fronts adorn the finish and sleek design of this lovely vanity table. Constructed from MDF, rubberwood, maple veneer. Includes mirror and matching bench. Flip top mirror with open storage area. Color of the bench: Walnut with beige colored upholstery. Cord management holes in the back for hair dryer. Two side drawers to keep your jewelry and make up items. Design of the handle: Square knobs. The Livingston 3-Piece Vanity Set with Trifold Mirror will add a touch of style and elegance to your bedroom décor. Manufactured wood construction renders robustness and durability to this appealing Vanity Set. 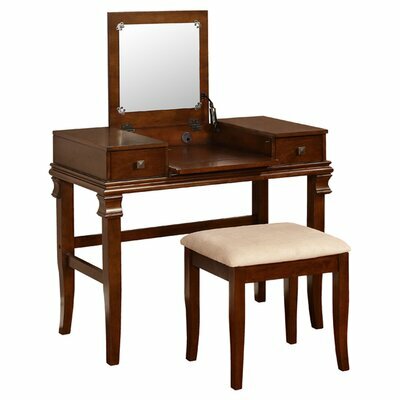 The Vanity Set includes a lovely vanity table with a tri-fold mirror and a beautiful matching bench. The vanity table features an extended top and one storage drawer for keeping vanity items in organized fashion. Drawer is felt-lined and accented with a classic drawer pull. Matching bench is upholstered in generously cushioned to give you optimum comfort when you sit on it. This Vanity Set will prove to be a smart choice for any bedroom setting. Also available in Cherry and White finish. 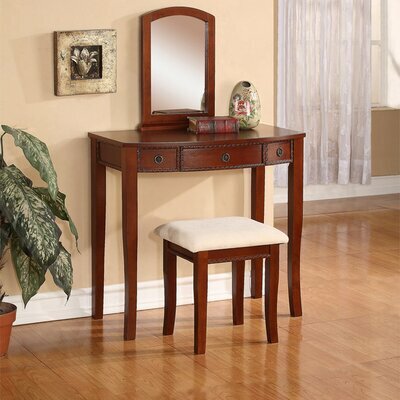 Vanity table includes one standing mirror and a matching bench. Tri-fold mirror for better coverage and view. Design of the handle: Metal drawer pulls. Seat of the bench is upholstered. Maximum weight capacity for the vanity table: 200 lbs. Maximum weight capacity for the bench: 150 lbs. The aesthetically appealing Corvally Vanity Set with Mirror will add style to your bedroom. This robust and durable vanity set is crafted from MDF and wood veneer. 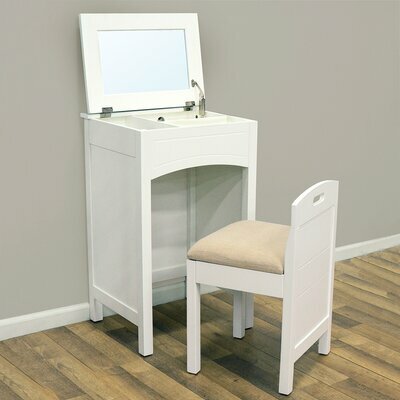 The traditionally fashioned Corvally Vanity Set with Mirror features a stylish vanity table in white finish and a matching bench. The vanity table includes a flip top mirror and storage compartment under the mirror. Matching bench is thickly padded and has a back for comfortable seating experience while you beautify your looks. This stylish as well as functional vanity table requires minimal assembly. Corvally Vanity Set with Mirror Collection. Manufactured from MDF with wood veneer. Finished back for refined and perfect look. It includes mirror and matching bench. Storage compartments on the table top. Comfortable bench is padded with poly foam and cushioned in white polyester. Design of legs: Squared legs. Requires minimal assembly and it is very easy to assemble. Required assembly tools: Phillips screwdriver and plastic head mallet. The gorgeous Moon Vanity Set with Mirror will create a stunning focal point in your bedroom. Solid wood and wood veneer construction makes this vanity set durable and sturdy. The traditionally designed 3 Piece Vanity set includes a vanity table with tri-fold mirror and matching stool. Spacious table top can be used to keep your jewelry box, perfumes or other prized possessions. Five generous drawers can easily accommodate all your vanity items and other knick-knacks. Comfortable bench comes with a thickly padded and upholstered seat. 3 Piece Vanity set Collection. Crafted from solid wood and wood veneer. 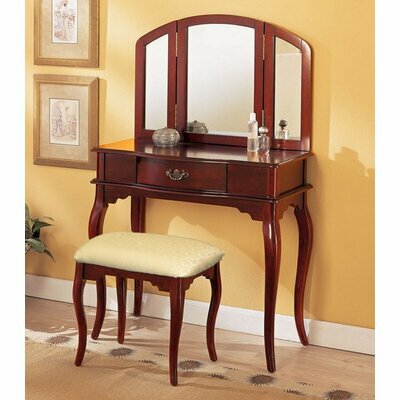 Vanity table comes with one standing mirror and a matching bench. Mirror can be removed easily. Bench color: Cherry colored base with white cushion cover. The bench is upholstered in tapestry fabric. Bench can be stored underneath the vanity table. Place it side ways to fit. Five drawers for keeping your jewelry organized. Drawers can accommodate hair dryer. Design of the handle: Drop pulls in classic design. Finished back for perfectly clean look. Corner block construction ensures structural integrity. Maximum weight capacity for the bench: 100 lbs. Maximum weight capacity for the vanity table: 80 lbs. Tools required for assembly and installation: Allen wrench. 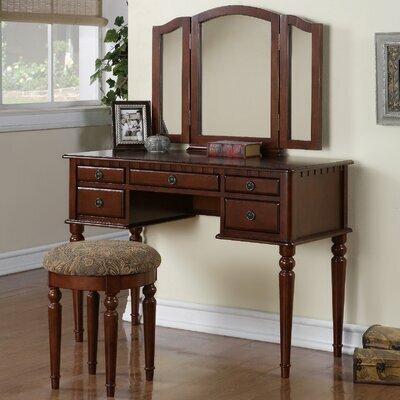 The attractive look of Powell Warm Cherry Vanity Set with Mirror will enhance the décor of your bedroom. It is crafted from sturdy rubberwood and medium density fiberboard. The appealing warm cherry finish blends beautifully with most of the decors. This elegant vanity table with a lovely tri-fold mirror and matching bench will enhance the beauty of any bedroom. Keep your make-up items, perfumes and other beauty accessories in five storage drawers. You can also place candle stands or other decorative items on the spacious table top. Matching bench has an upholstered and very comfortable seat. Traditional style with distressed finish takes this vanity set to another level. This classic beauty is a must have for every traditional bedroom. Warm Cherry Vanity set Collection. Made from rubberwood and medium density fiberboard. Standing mirror and matching bench included. Bench color: Warm Cherry base and legs with white upholstery. Upholstery material is 63% cotton and 37% polyester. 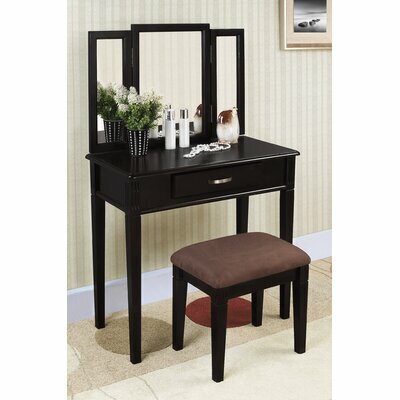 Extended table top can accommodate your beauty accessories and other vanity essentials. Five working drawers for storing your make-up items and jewelry. Knobs in antique brass finish. Manufacturer provides 1 year limited warranty against defects in manufacturing, materials or workmanship. Elegant profile of this lovely Linon Molly Vanity Set will enhance the charm of your beautiful bedroom. For utmost functionality, this vanity table comes with an attached mirror and a coordinating bench in plush upholstery. The vanity table features single drawer and spacious table top for keeping your jewelry and beauty accessories. Rich cherry finish complements the simple straight lines and traditionally styled carvings on the edges. This timeless beauty is not only practical but also stylish and graceful. Manufactured from solid wood, MDF and maple veneer. Includes one flip-top mirror and matching bench. Vanity table and bench features intricate carved details. Seat is upholstered in plush off white fabric. One drawer provides sufficient storage space for keeping your jewelry and make up items. Maximum weight limit for the vanity table: 15 lbs. Maximum weight limit for the bench: 250 lbs. The set requires assembly and very easy to assemble. 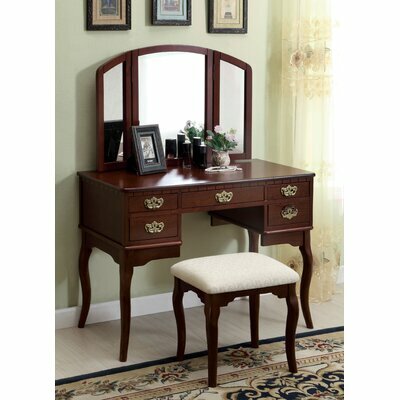 The gorgeous Linthicum Vanity Set with Mirror is a piece of classy art. 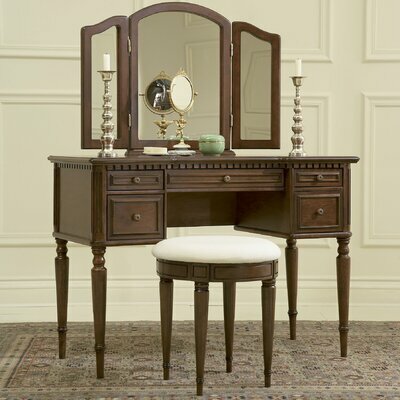 This stunning vanity set features a traditional design, a profile-edged top, spindle legs and antiqued brass hardware. Warm and rich multi-step cherry finish will complement an array of room decors. Mirror curved accents that enhance the overall look of this lovely vanity set. Three generous drawers provide ample storage space for keeping vanity essentials and other items. Linthicum Vanity Set with Mirror Collection. Made from poplar wood, manufactured wood and veneers. 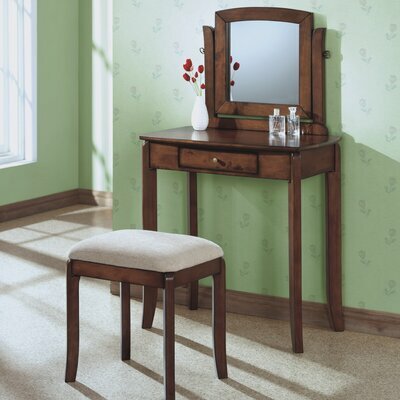 Vanity set includes a tilting mirror with matching bench. Profile-edged top with curved accents of mirror and its attachment. Design of legs: Spindle legs. Three drawers provide ample storage space for keeping your vanity essentials and other items. One middle and two side drawers. Design of the handle: Knobs in antique brass finish. Vanity set requires assembly with the help of a screwdriver. Stylish Monarch Specialties Inc. Vanity Set with Mirror will prove to be a fabulous addition to any bedroom or dressing area. With this gorgeous vanity set, create a peaceful and cozy space to embellish yourself for a formal dinner party or a fun night out. Monarch Specialties Inc. Vanity Set features an elegant vanity table, vertical swivel mirror and a matching stool. The vanity table has one drawer where you can keep your vanity essentials and other accessories. Smooth lines, straight legs and distressed walnut finish accentuate the overall look. Distressed and rich walnut finish. Standing mirror comes in silver finish. Mirror is adjustable and can be removed when needed. Matching stool with padded beige chenille seat cushion. Straight legs that have tapered ends at one side. Design of the handle: Knobs. Maximum weight limit for the bench: 180 lbs. Practical and stylish Andover Mills Tucker Vanity Set with Mirror will add sophisticated touch to your bedroom. Crafted out of manufactured wood, this vanity set will last long for many years to come. Its contemporary design and bold black finish blend beautifully with an array of bedroom decors. 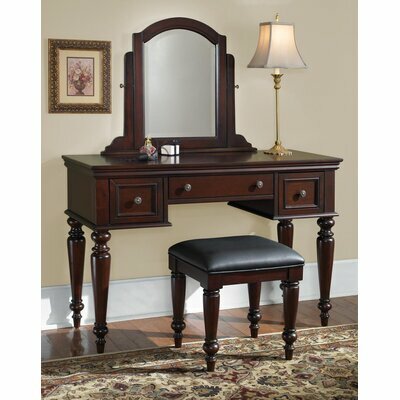 This graceful vanity set includes a vanity table with tri-fold mirror and matching bench. The vanity table has a spacious top and one felt-lined drawer for keeping your jewelry, make-up items and other beauty accessories. Plush microfiber upholstery and luscious padding give comfortable seating experience. Andover Mills Tucker Vanity Set Collection. Includes tri-fold standing mirror and matching stool. Seat cushion is upholstered in plush microfiber material. Design of legs: Tapered legs. Single drawer where you can keep your make-up kits and brushes. Design of the handle: Drawer pull. Maximum weight limit for the vanity table: 150 lbs. Maximum weight limit for the bench: 200 lbs.